I imagine that the first thing Martha Stewart does in planning a dinner party is create a guest list. Of course it’s possible that, instead, she begins with an idea of some dish she’s been craving, say, pork belly and tomato aspic, and then goes through her mental list of friends, crossing off those she knows will hate tomato aspic. Whatever Martha’s approach, it couldn’t be farther from mine. I start with paper napkins, not any paper napkins, but those that catch my eye when I’m not shopping for them. 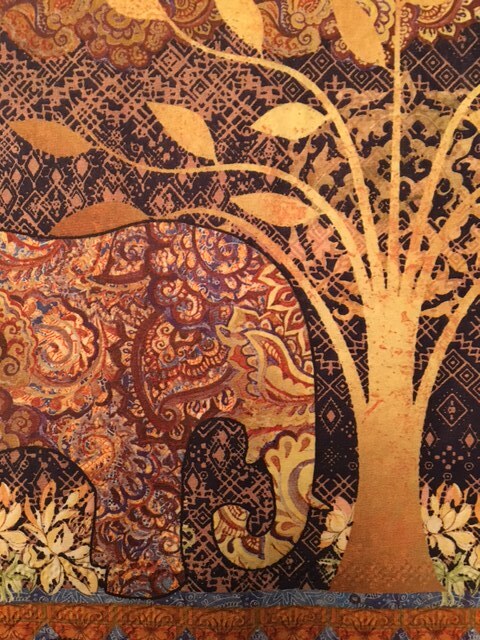 A week ago, I was wandering through the gift shop of the Seattle Repertory Theatre and spotted napkins that featured a tastefully psychedelic, bronze elephant. The beast was in a garden setting that belonged to the India of maharajas and maharanis. I bought the napkins. “Now that I have these napkins,” I told my husband, “we need to invite friends to dinner.” I could have entertained friends using napkins I already possessed, except that my other winter-themed paper napkins came from Iceland. If I used them, I’d run out before winter was over. 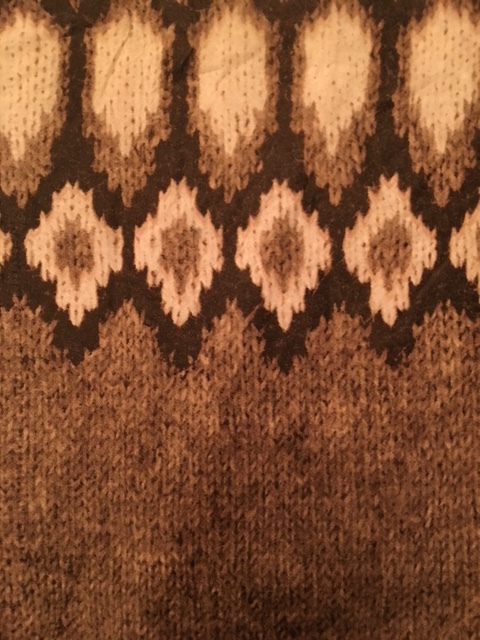 They featured the design of the Icelandic sweater. For me they are better than the real sweaters made from wool and presumably itchy. I’m meting them out very slowly, because it’s not likely I’ll find substitutes to bring back the same happy travel memories. I pictured the bronze elephants matching my bronze placemats and could already envision my gorgeous Martha-style table setting. That picture lasted until the day before the planned dinner, when my husband and I pulled the placemats out of the drawer. Hmm. They weren’t really bronze, but rather a two-tone, indescribable metallic color. Oh well, the elephants were still beautiful even if they didn’t look quite right with the placemats. “That’s not the only problem,” my husband said, “We have four placemats, not six.” So I had no choice but to add two multicolored, multi-patterned placemats to the four metallic ones. And none of them matched the napkins. The day of the party, we discovered another snag: we had only five bowls for the hearty soup to feed six hungry guests. The only other obstacle to a brilliant Martha-Stewart table was the barely begun picture puzzle lying at the end of the dining room table. I’d started to put the 750 pieces together a few weeks ago, when we were staying in a cabin in the snowy Methow Valley. The image on the puzzle was so complex that I didn’t get very far on it, so I brought it home. I studied the table before the guests arrived: the mis-matched placemats that didn’t go with each other or the napkins, a picture puzzle filling a third of the table, and one missing soup bowl. I asked myself what Martha would do if she found herself in a situation like this. Of course she wouldn’t find herself in this predicament, so I couldn’t answer my question. After the meal was over, I explained to the guests that the napkins were what spurred me to invite them to dinner. They nodded, unfazed by this revelation, and urged me to keep buying napkins. This entry was posted in friends and family, humor and tagged Martha Stewart, table settings. Bookmark the permalink. As the lucky recipient of dinner via elephant napkins, I certainly urge continued unplanned shopping trips. I can imagine all sorts of get-togethers spurred by unexpected encounters with, say, olive forks. Haha! I always start with the recipes I want to make, and then people I want to spend more time around. No napkins at all! (Called serviettes in Australia to my annoyance.) I generally approach the table setting with the same clunky bohemian disregard for matching as I would any other meal. By encouraging fancy dress, photos and free flowing wine hopefully the guests are distracted from my lack of homegood splendor. You are so funny. I’ll bet it was a great event. As a lover and ardent purchaser of paper products, I totally get it. Your latest blog certainly brought a smile to my face. Now what about all those napkins where only 2-3 match–perhaps a smorgasbord is in order. I don’t cook or entertain the way I used to, but I can assure you that when I did, napkins figured very importantly in the whole event! Glad you still like to do it all! Love the elephants! Love the Icelandic design!